Yuki is a piano player in Bristol, UK. Making full use of the piano, she plays classical music, blues, boogie-woogie, R&B, rock 'n' roll, and jazz with equal enthusiasm. Born in Sapporo, Japan. Studied music and performing at Kunitachi College of Music and Shobi in Tokyo. Further studies at Ecole Normale de Music in Paris. Moved to Bristol in 2001. I am interested in any opportunities to perform and present piano music to everybody, Bach to Boogie Woogie. Please visit my other website for piano tuition in Bristol. Visit my MySpace page and become my friend! 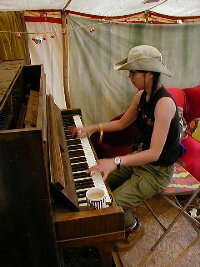 www.myspace.com/yukipiano. New album Piano Picnic on sale!